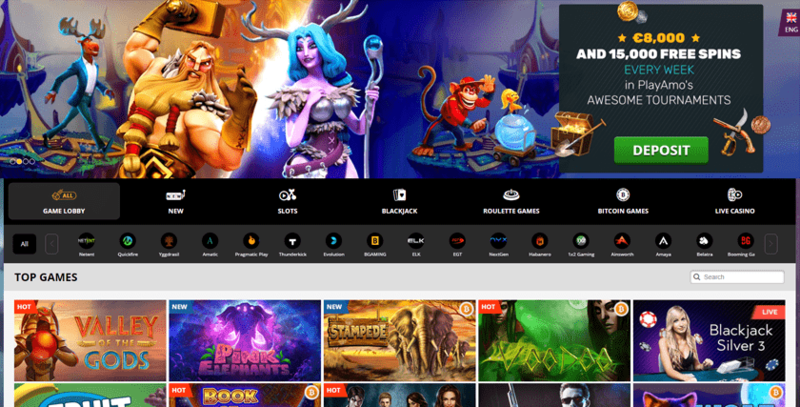 The Playamo casino platform hosts a wide variety of games, including both software and live dealers, which are all accessible on desktop and mobile devices. Even more impressively, the casino also boasts a full gaming license from the Curacao regulators. Our comprehensive Playamo review is going to cover every aspect to the operator, ranging from available games, supported currencies, promotions and more. As a fairly new casino, Playamo has a lot to prove. However, our end-to-end gambling experience was nothing but positive. We were able to open an account in 8 seconds, deposit our cryptocurrency coins instantly and then play a range of games without issue. This included their wide-range of table games, live dealers and slots. Potentially the most impressive outcome to our stress-testing was the fact that our withdrawal only took 20 minutes before it reached our cryptocurrency wallet. We also felt comfortable knowing that Playamo are fully licensed, all of their games are supported by a provably fair protocol and the website is secured by SSL encryption. Moreover, their 24/7 live chat facility was highly responsive and although we only tested it in English, support is available in 8 languages. Ultimately, Playamo has the potential to be a market leader in the crypto-casino industry. Playamo are an online casino that specializes in both cryptocurrency and fiat currency deposits and withdrawals, thus making them a hybrid casino. One of the more recent casinos to join the cryptocurrency revolution, Playamo were launched in 2016 and are owned by parent company Direx N.V Casinos, an entity based in Cyprus. The Playamo team understand that the online casino sector is quickly becoming a highly crowded space. As a result, they offer a fairly reasonable welcome package to entice new players to their platform. Although promotions are ever changing, their hallmark sign up offer consists of a 100% first deposit matched bonus, up to a maximum of $100. However, in a highly disappointing move, those who intend on depositing with cryptocurrency are exempt from all sign up offers. In our opinion, this is a strange move by Playamo. When we contacted the management team they informed us that although this was sometime they might consider in the future, as things stand they are keeping their promotions to fiat currency only. Moreover, although there is a really good VIP program in place, again this is not available for cryptocurrency wagering. It is important to remember that as good as deposit bonuses are, if you are looking for a long-term crypto casino to use for your recreational gambling, then there are other, more important factors to consider. The Playamo casino platform covers virtually every traditional game that you would expect to find at your local land-based casino, including the likes of roulette and blackjack. There are also hundreds of different slot machine games to choose from, fully supported by a range of established software providers. Furthermore, Playamo also have a neatly laid out live casino section, which allows you to bet on a range of table games that are facilitated by real-world dealers. There are 30 live dealer tables in total, containing several variations of blackjack, baccarat and roulette, as well as having VIP tables for those who prefer to bet big. On the flip side, there is no sports betting facility, nor is it possible to play poker with other players. However, Playamo are still a relatively young operator, so hopefully they will consider adding these in the future. When it comes to software providers, Playamo have one of the largest range of gaming developers. To make things easier for you we have compiled a complete list of all of the providers they are currently using. The Playamo team claim that the account sign up process takes just 8 seconds, which we thought was a rather bold statement. However, their boldness is fully backed up, as all you need to do is supply your email address and choose a password. When depositing cryptocurrency in to your Playamo account, your funds are credited instantly as they do not require any block confirmations. The reason it is better to deposit using cryptocurrency, rather than real-world fiat, is that you do not need to upload any documentation. It can be really annoying when traditional casinos ask you to do this as not only is it intrusive, but it also delays the withdrawal process significantly. We wanted to test out if Playamo’s claims of ultra-fast withdrawals were true, so we requested a withdrawal back to our Bitcoin wallet. Remarkably, our funds were received back in to our Bitcoin wallet within about 20 minutes from making the request! This is in stark contrast to using a debit or credit card, as banking delays results in an average wait of three days before the funds reach a bank account. As a hybrid casino, Playamo accepts both fiat currency and cryptocurrency. On the former, all traditional payment methods are supported such as a debit/credit card and bank transfer, as well as various e-wallets such as Skrill and Neteller. When it comes to cryptocurrency deposits, Playamo support five different coins which we have listed below. Although Playamo does not ask for any information when you register an account (asking only for an email address and password), citizens from certain nations are prohibited from joining. This is an unusual move, as cryptocurrency transactions are anonymous. Essentially, your cryptocurrency wallet address contains no information about the users, nor does it reveal where they are from. Moreover, if using an anonymous browser (such as TOR), users have the ability to obscure their true location. In a nut shell, although we do not advise it, if users register an account from a banned country, it remains to be seen how the Playamo team would be aware of this. Nevertheless, we have detailed the official list of prohibited nations below. A major plus point that was discovered during our comprehensive Playamo casino review was that they are fully regulated by the Curacao authorities. As cryptocurrencies do not fall under the same regulations as real-world cash, there is actually no requirement for a crypto-casino to be regulated. However, this is a great move by the team as it signals they are highly credible. A further plus point for Playamo is that their games are backed-up by a provably fair protocol. This is when the outcome of each game can be independently verified by the public, which adds a huge layer of transparency to the platform. Each provably fair gaming outcome is generated by a cryptographic algorithm, which cannot be tampered with or pre-determined by the casino. Moreover, this is independently audited by an external stakeholder. In this sense, alongside their gaming license, Playamo are of the safest and fairest operators in the crypto-casino industry. This is further amplified by the platform’s installation of SSL encryption security, which ensures that player accounts are 100% safe from malpractice or hack. Playamo casino is available in a total of eight different languages, which includes English, Finnish, German, Norwegian, Polish, Swedish, Russian and Turkish. As one would imagine, customer support is available in all of these languages. In what seems to be a minimum requirement from online casino players, the Playamo platform has a live chat facility available, which can be accessed from anywhere in the world 24/7. When we tested this out, not only were their response times practically instant, but they were able to resolve our query each and every time. If for some reason the live chat facility is not available, you can always contact the Playamo support team through email. At this stage there is no phone support at Playamo casino.